In a 2016 post entitled “Top 4 Things Texas is Doing Right When it Comes to Work Zone Safety”, we wrote, “Texas held the highest number among work-zone fatalities in 2014. Since this alarming fact, the state has been doing its best to take action on creating a safer environment in the work-zones.” Since then, Texas has taken another significant step forward in becoming one of the leaders in TMA truck regulations across the entire country. In the past, Texas’ regulations allowed for some variance in the weight of the TMA truck. According to the September 2012 edition of Texas Department of Transportation (TxDOT)’s “Compliant Work Zone Traffic Control Device List”, “The supporting vehicle shall have a gross (i.e., ballasted) vehicular weight of 20000 ± 1000 pounds unless another weight is recommended by the TMA manufacturer.” While this provides some guidance, it allows significant variance from manufacturer to manufacturer depending on what they recommend. Since then, TxDOT has made regulations stricter in terms of the TMA truck’s weight. In their most recent edition of “Compliant Work Zone Traffic Control Device List”, published in December 2017, the regulation was revised to say, “The host vehicle for the TMA and TA shall weigh a minimum of 19,000 pounds.” For all projects beginning in January of 2018, there is no allowance for a manufacturer’s recommendation. From the beginning of this year, all TMA trucks operating in Texas must weight over 19,000 pounds without exception. Why is a Truck’s Weight Important? Why is removing the allowance for the manufacturer to recommend a weight so important? Because by making the standard weight greater than 19,000 pounds, it removes the possibility for a TMA truck to be in operation weighing less than that amount, which is crucial to worker safety. Why is a higher weight so important for TMA trucks? When a TMA truck gets hit by a vehicle, the force of the impact pushes the TMA truck forward. This distance that the truck rolls forward is known as roll ahead distance. In a work zone, there needs to be adequate space for the truck to roll forward in the event of a crash without running into the work crew it is there to protect. As it turns out, the weight of the TMA truck is one of the three biggest contributing factors to how much roll ahead distance should be allowed for, with the other two being the speed of the impact as well as the weight of the incoming vehicle. Learn more about roll-ahead distance by watching the above video to see how a TMA truck’s weight affects how far it rolls ahead. In a study titled “Guidelines for the Use of Truck-Mounted Attenuators in Work Zones”, written by Jack B. Humphreys and T. Darcy Sullivan, it shows just how much of a contributing factor the weight of a TMA truck is in how much roll ahead distance should be allowed for in both stationary and mobile operations. To show you just how much of a difference weight makes, a stationary 10,000 pound TMA truck has a roll ahead distance of 200 feet when struck by a 24,000 pound vehicle traveling between 60 and 65 miles per hour. 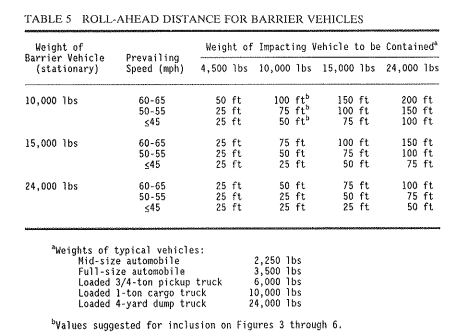 In the same scenario, a 24,000 pound TMA truck would only have a roll ahead distance of 100 feet. By its nature, a heavier TMA truck will have less roll ahead distance than a lighter one. 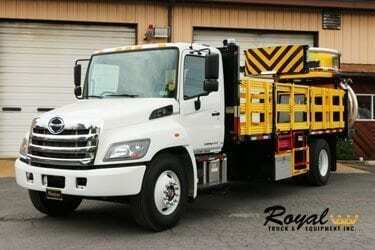 If a TMA truck is too light, it presents a significant hazard to the workers it is there to protect. So how far exactly should your TMA truck be positioned behind your workers? Once you know your truck’s weight and other details about the operation, such as the speed of motorists on the road and whether the operation will be stationary or mobile, you can consult the American Traffic Safety Services Association’s “Field Guide for the Use and Placement of Shadow Vehicles in Work Zones” for their recommended distances. As you can see, if your truck weighs less than 22,000 pounds, you need to allow for more space between the front of your truck and the rear of the work zone. 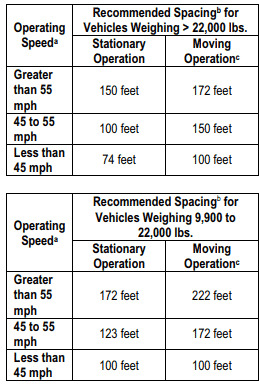 Using the same weights as in the prior example, you would need to allow for 222 feet when using a 10,000 pound TMA truck in a mobile operation where traffic is traveling greater than 55 miles per hour. In the same scenario, a truck weighing greater than 22,000 pounds would only need to be 172 feet in front of the work zone. Maintaining these distances is crucial to keeping workers safe in the zone. Deviating too far from the prescribed distance, in either direction, poses inherent dangers to your work crew. If your TMA truck is too close to the workers, it will not allow for enough roll-ahead distance in the event of a crash. If the TMA truck is too far away from the workers, it will allow for other vehicles to pass in front of the truck and dangerously enter the work zone. So how do you know how far you are from the workers you aim to protect? The easiest way is to use the broken lane lines in the middle of the road. While this may vary state-by-state, the general standard is a distance of 40 feet from the beginning of one striped line to the beginning of the next. In operations where these broken lines are available, this is a good method to ensure your following distance is appropriate! To be safe, this distance should always be verified before using it as a method of measurement. In total, the weight of the truck is vital to the amount of roll-ahead distance it will have in the event of a crash. If the truck’s weight is too low, it will have significant roll-ahead distance, thus creating a dangerous situation for the workers it is there to protect. For those who do not already know, ballasting is simply the practice of adding weight to the truck in order to ensure it is over the minimum threshold. In the previous edition of TxDOT’s “Compliant Work Zone Traffic Control Device List”, ballasting was only ever mentioned to discuss the gross weight. The most recent edition of document gives exact guidelines on how the TMA truck needs to be ballasted. The most important wording in this phrase is that the ballast needs to be, “properly attached or contained within.” Why is this important? Because improper ballasting can be extremely dangerous! Unfortunately, it is not just good enough to add weight to the truck in whatever manner is the simplest. One of the crucial safety elements in TMA trucks is how they are ballasted. The difference between a properly ballasted truck and an improperly ballasted truck is significant enough to make the entire build of the truck unsafe. In the past, common practice was to chain a Jersey barrier to the bed of the truck. While this effectively added the weight to the truck, this also presented significant hazards to both the driver of the TMA truck and other vehicles in the area. When the TMA truck gets hit, the chains surrounding the Jersey barrier can easily break due to the force of the crash. This caused the Jersey barrier displace and become a dangerous projectile, presenting potentially dangerous outcomes to workers and other drivers alike. What are the safest ballasting practices? As your truck drives down the road, the bouncing of the truck caused by bumps on the road causes the ballast’s concrete to break apart and weaken. When the concrete is broken apart, the momentum caused by a crash into the attenuator will shift all of the pieces forward, thus lengthening the truck’s roll ahead distance and potentially creating a dangerous situation for the workers in front of the truck. While adding rebar to the ballast will not entirely prevent the concrete from breaking apart, it will lengthen the time it takes before it does! Proper ballasting is crucial to the build of the truck and the safety it provides the workers. If the truck is improperly ballasted, it can make an otherwise safe truck into a hazard for the work crew and other travelers in the area alike. Most recently, Texas has gone even further in strengthening their regulations surrounding the use of TMA trucks. Do you know what the changes are? 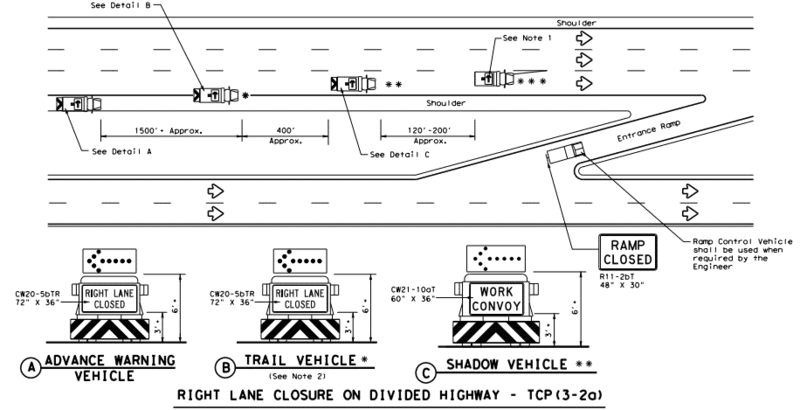 Traffic Control Plan Standard for right lane closure on a divided highway, as per TxDOT. As you can see three TMA trucks are required in this scenario. Are you interested in getting a complete listing of Texas’ regulations surrounding TMA truck usage in different scenarios? By clicking the link HERE, we will send you a complete listing of the state’s regulations and answer any specific questions you may have regarding the subject. At any given time, there are more than 2,500 active highway work zones in Texas. In addition, Texas had 172 fatalities in work zones in 2016. Needless to say, the state is on the forefront of the highway construction industry. Over the last few years, Texas has taken several significant steps in order to increase work zone safety. In terms of regulations, TxDOT has strengthen its regulations regarding TMA truck manufacturing, ensuring that each truck is as safe as possible before it becomes operational. By taking away the manufacturer’s recommendation for the truck’s weight and by stipulating exactly how a TMA truck needs to be ballasted, Texas is creating a significantly safer work environment in highway work zones. Additionally, its latest regulations surrounding the requirement to have 3 TMA trucks in certain mobile operations also promote a safer work zone. These changes represent massive improvements for the state! Want to learn more about regulations in Texas or in your own state? Request a comprehensive regulation book here! Does your company promote safety in your work zones? June is National Safety Month. Join our “Welcome to the Safe Zone” initiative and receive a window cling to show to your workers and customers that your company takes safety seriously! Click HERE to sign up for our weekly email newsletter to receive the FREE window cling!